Sydney was born on 10th September 1840 in the cottage opposite the information centre, now Victorian Pantry Tea Rooms. He lived in Okehampton for about six years, yet later in life he gave so much to the town. Living next to the White Hart Hotel must have been exciting for a young boy as stage coaches came and then went off to far flung places like Exeter and London. This seemed to spark an interest in travelling for the young Simmons, at the age of five, he went to Exeter with his mother. They left Okehampton at eight in the evening in a wagon drawn by three horses and arrived in the city at seven the next day. What an adventure this must have been for Sydney. In about 1846 he was sent away to a private school in Lincolnshire where he stayed for four or five years. He returned to Okehampton in 1851 because his father had died. His mother, brother and two sisters, Mary Ann and Sophia continued to run the printing business but Sydney moved to Devonport in Plymouth. Here he took up an apprenticeship with a drapery firm and was learning that business for the next ten years. In 1862 at the age of 22 he went to London to work for a large carpet manufacturing company; this was the turning point for Simmons. He joined the Queen's Westminster Volunteers and became a marksman and was taken in 1907 on duty when the Prince of Wales, later to be Edward VII, brought his bride Alexandra, to London. The big break was in 1862, when Sydney was sent to America as a sales representative for the carpet company. Over the next 10 years he travelled across America and Canada for the company, doing around 30,000 miles some years. During this time he acquired the rights to a mechanical process for cleaning carpets and in 1888 he returned to London. He bought a house in Finchley, called it 'Okehampton' and then got married. Around this time he started two companies, The Patent Steam Carpet Beating Company and The Compressed Air Carpet and Tapestry Cleaning Company. They became very successful, making him a wealthy man. During the following years, he often visited Okehampton to see his friends and relatives, never forgetting his birth town. 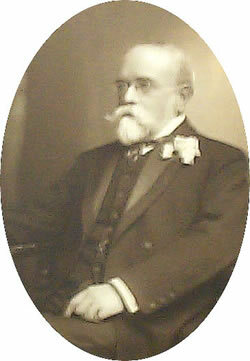 By 1900 Simmons was a very rich man and five years later he started to buy up land in Okehampton. He first bought a field in East Street in Newcombe Cascade, 1905 for the purpose of building some alms houses. In 1911 he acquired Okehampton Castle and the medieval deer park and spent the next few years removing the vegetation from the ruin and re-pointed the masonry. The grounds were laid out with many paths and seats for people to enjoy the area. He also added a veranda to the now demolished Lodge to the Castle. In 1917 the site was given to the town with £1,000 invested in Consols for its upkeep. Okehampton Golf Course stands in the Old Deer Park and this land was given to the Golf Club by Mr Simmons. He was a very keen golf player and was the largest shareholder in the Club. The nine hole course was opened on 16th July 1913 and was later enlarged to eighteen holes. Yet another generous gift from Mr Simmons came in 1921 when the Town Council acquired Kempley Meadows, but then had the cost of laying out the recreation grounds which included a bowling green. Simmons came forward with an offer of £500 for the work but the work had to be done by the men of the town who were out of work. Sydney Simmons died on 29th April 1924 but he did not forget Okehampton. In his will he left £10,000 to erect almshouses on the site in East Street which he had bought way back in 1905. These were opened in 1939. Sydney Simmons was truly a wonderful man who loved Okehampton and this shows through his gifts to the market town. Sir William Treloar, the once Mayor of London, said of Sydney Simmons "He is a man who has the head to make money and the heart to it give away". How very true of Okehampton's biggest benefactor. With thanks to Gill Lower, Christine Marsh and Okehampton Town Council for their help with article.